Yale University Press, 9780300211924, 668pp. 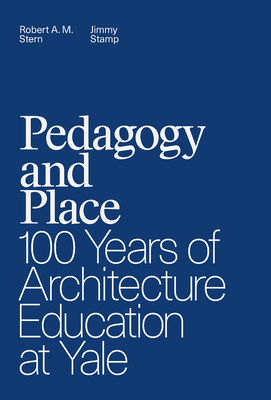 Marking the centennial of the 1916 establishment of a professional program, Pedagogy and Place is the definitive text on the history of the Yale School of Architecture. Robert A. M. Stern, current dean of the school, and Jimmy Stamp examine its growth and change over the years, and they trace the impact of those who taught or studied there, as well as the architecturally significant buildings that housed the program, on the evolution of architecture education at Yale. Owing to the impressive number of notable practitioners who have attended or been affiliated with the school, this book also contributes a history, beyond Yale, of the architecture profession in the twentieth century. Featuring extensive archival research and illuminating firsthand accounts from alumni, faculty, and administrators, this well-rounded and engaging narrative is richly illustrated with historic photos of the school and its studios, images of student work, and important architectural achievements on and off campus. Robert A. M. Stern, founder and senior partner of Robert A. M. Stern Architects, is dean of the Yale School of Architecture and has served in that role since 1998. Jimmy Stamp is a writer at Robert A. M. Stern Architects whose work has appeared in The Guardian, Smithsonian, and the Journal of Architecture Education.